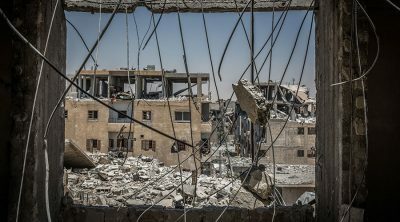 As Jan Egeland, the UN humanitarian adviser on Syria, has stated, if there’s a worse place to be in the world at the moment than the Syrian city of Raqqa, then it’s hard to imagine. This week, the UN estimated that the battle to capture the de facto ISIS capital is costing the lives of 27 civilians a day. It’s not just the almost non-stop aerial bombardment and shelling from the mainly Kurdish Syrian Democratic Forces that the 25,000 or so citizens in ISIS-held parts of the city have to endure. “Access to safe drinking water, food and other basic services is at an all-time low with many residents relying on food they had stored up earlier to survive,” says UN public information officer David Swanson. We can only imagine the headlines if Russia was doing all this. But because it’s the US and its allies, the international reaction has been muted to say the least. It’s revealing to compare the “humanitarian” concern voiced by pro-war Western politicians and mainstream media outlets when Russia began its military operations in Syria in September 2015, with the lack of concern over what’s been happening in Raqqa. On October 2, 2015, the claim made by then-US President Barack Obama that Russian strikes would only “strengthen ISIS” made Western news headlines. Accusations that Russia was committing war crimes also received prominent coverage. But when the US-led coalition bombs ISIS, the reporting from mainstream outlets is different. Then, the operation is presented much more positively, with little or no talk about how it will “strengthen” the enemy or “fuel more extremism and radicalization.” There is also little or no talk of war crimes. A meticulously-researched Alert from Media Lens earlier this summer compared the coverage of the sieges of Aleppo and Mosul. As I noted here in an earlier Op Edge, it was deemed a ‘Thought Crime’ by Imperial Truth Enforcers to actually refer to the recapture of eastern Aleppo by Syrian government forces as a ‘liberation.’ Pro-war Labour MP John Woodcock even went so far as to call the left-wing Morning Star newspaper “traitorous scum” for daring to defy the gatekeepers and use the ‘L’ word. But of course, if it’s the US and its allies doing the bombing, then using the word ’liberation’ is de rigueur, regardless of how much death and destruction the ‘liberation’ causes. There have been no calls from ‘Inside the Bastille’ Western politicians or media pundits for people to protest outside US embassies about the number of civilians killed by coalition airstrikes in Raqqa – as there were over Aleppo. And absolutely no likening of coalition actions to those of the Nazis. It’s worth noting, too, that while the US and its allies repeatedly called for a “humanitarian pause” in the fighting for Aleppo, they’ve rejected the UN calls for one in Raqqa. “Going slower only delays the liberation and subsequently costs more civilians their lives,” US Colonel Joe Scrocca, director of public affairs for combined Joint Task Force-Operation Inherent Resolve, told Middle East Eye. Furthermore, the spread of IS to Syria was actually welcomed by the US and its allies as a way of weakening the secular Ba’athist government in Damascus, which Western neocons were desperate to see toppled because of its friendly links with Iran and Russia. 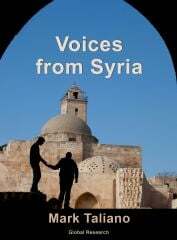 “If the situation unravels there is the possibility of establishing a declared or undeclared Salafist principality in eastern Syria, and this is exactly what the supporting powers to the opposition want, in order to isolate the Syrian regime, which is considered the strategic depth of the Shia expansion (Iraq and Iran),” – declared a secret US intelligence report, which was declassified in 2015. In 2016, a leaked tape conversation between US Secretary of State John Kerry and anti-government Syrian activists revealed how the US was pleased to see Islamic State gain territory. “The reason Russia came in is because ISIL was getting stronger,” Kerry admits, flatly contradicting the claims made publicly by the State Department in October 2015 that Russia wasn’t targeting ISIS/ISIL. “Daesh was threatening the possibility of going to Damascus and so forth,” Kerry went on. “We were watching. We saw that Daesh was growing in strength, and we thought Assad was threatened. We thought, however, we could probably manage. You know, that Assad might then negotiate,” he said. The US and its allies didn’t just watch with pleasure as ISIS expanded – they aided the process. They did this not only by giving money and weaponry to ‘moderate rebels’ who then – surprise, surprise – defected to Abu Bakr al-Baghdadi’s head-chopping outfit, but by targeting forces that were opposed to Islamic State. Israel, for instance, has bombed Syria on countless occasions in the last few years, but each time its attacks have been against those fighting ISIS. “An aspect of the conflict in Syria that has not received the attention it undoubtedly deserves, has been the role of the Israeli Air Force (IAF) in acting as the de facto air force of Daesh [ISIS] and sundry other Salafi-jihadi and rebel groups fighting in the country,” notes John Wight. We must not forget too that if Washington’s Endless War Lobby had got their way in August 2013, and the US and its allies launched a full-scale military assault on the Syrian government – then Islamic State and its affiliates would probably now be in charge of the entire country. Yet the failure to bomb Assad four years ago is still openly regarded as a tragedy by Western regime-change hawks. The city is most definitely not a “good base” for tourists today. The bombed-out ruins of Raqqa and the rotting corpses lying on its streets are a testament to a ‘liberal interventionist’ neo-con foreign policy, in all its bloodstained, hypocritical, ‘humanitarian’ glory.